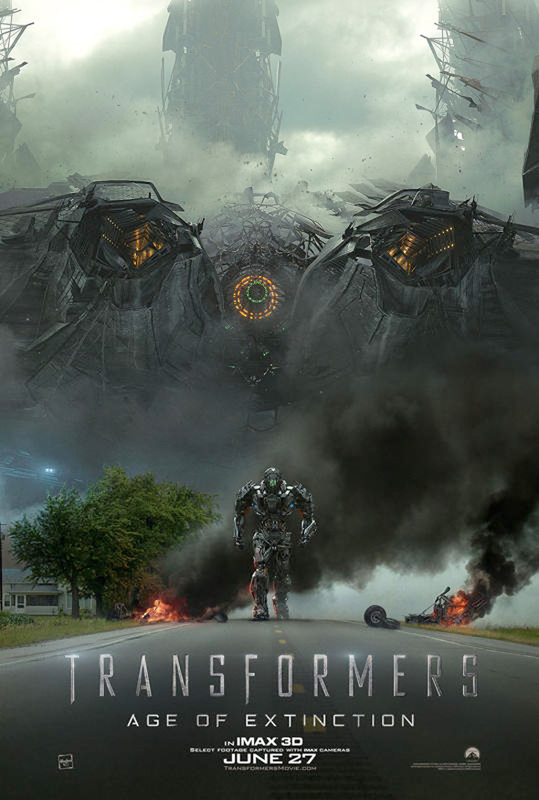 Following the full trailer for Transformers: Age of Extinction, along with the poster featuring Optimus Prime standing like Lancelot with a sword, we have a new IMAX poster for the pseudo-reboot and sequel in the Hasbro toy film franchise. This one simply takes a shot from the trailer where the enemy arrives near Mark Wahlberg's farm and begins wreaking havoc on Earth again, and just puts it in the frame of a poster. It's a cool shot, but there were plenty of quick glimpses in the aforementioned trailer that felt like they were straight out of Transformers: Dark of the Moon, but that's Michael Bay for you. See the poster! yep, just 25x the size. I keep hearing rumors that is Lockdown. Whoever he is he looks pissed. That is what I have been hearing at all fan & TF-oriented sites as well. Plus, on the TF-sites, codes for TRU & Target have been leaked, w/ Lockdown name attached to a few. I better see Slag, Snarl, and Sludge in T4 too or i'm gonna be pissed. Sadly, Slag is the only one of those three that made it into the film and he isn't even named Slag, which I personally don't mind. I was really disappointed to find out there's not going to be a stegosaurus in it. Snarl and Sludge were replace by a spinosaurus and I think the other guy is a raptor. WHAT!!! i f***** knew it, I knew Bay was gonna pull some shi+ like this. Even though the trailer looks amazing, that just pisses me off. It's always a half-assed approach or twist with that guy to please his own personal preference. He has no idea how much it would please the fanbase to just follow the Transformers comics/cartoons as they are. The transformers story is already a perfect blue print, alls he has to do is just follow it. Theres no need for tweaking or revamping anything. Someone needs to have the balls to just tell Bay that sometimes less is more, Jesus! Well even though you're the bearer of bad news, thanks for letting me know. I had a feeling but thanks for the confirmation. Great comment, could'nt have conveyed it better myself. One of the new toys showed at NY toy fair show what lockdown looks like and he looks like this guy in the poster. Doesn't really sound like low expectations, but I'm excited as well 🙂 I like how Bay shoots his movies. He's truly the best at what he does. Yeah, this looks "broad". More like more of the same noise and nonsense. Thats Galvatron. Wich means Unicron can be there too. No. That's Lockdown. Which means that's Lockdown's Ship. Ok its lockdown, Galvatron will still show and have Megatrons mind trapped in him by Unicron. Unicron will probably show in the 3RD of this new trilogy. As I said this new series,basically a reboot. Not counting the previous movies. Did you delete the other comment you made calling it Unicorn? Fucktard. This is not a reboot, this takes place 4 years after the 3rd movie. Are you stupid? How do people describe star wars? The Original trilogy and the new trilogy. This is just the second trilogy of the transformers movies, following a new group of people, a few years after the first trilogy. Ken is saying that Unicron will probably show up in the 6th overall movie, which angers me because I've been hearing promises of Unicron since the first movie went into production. who's unicron at first it looked like unicorn and yeah I maY BE SLIGHTLY DISLEXIC KIND of !